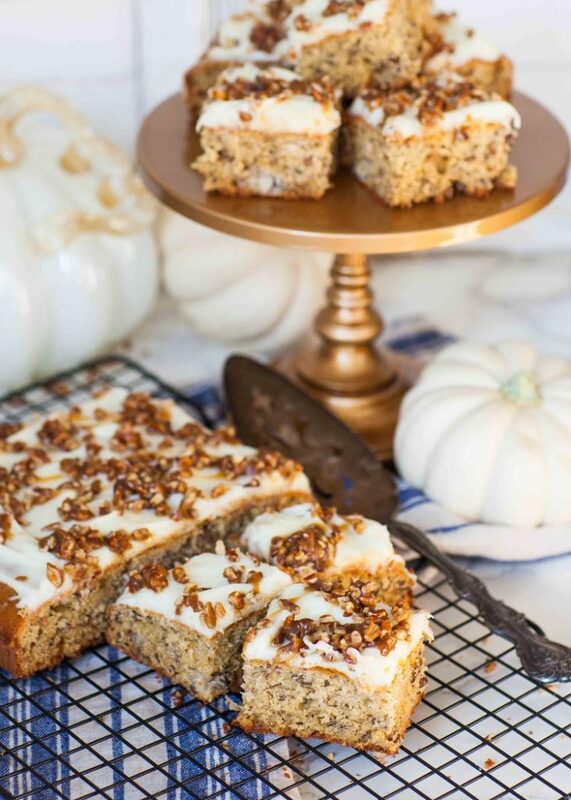 Simply the best simple and delicious banana nut bars with creamy cream cheese frosting! These bars are so fluffy, moist and flavorful; dotted with crunchy pecans and topped with a simple cream cheese frosting. I also like to add a pinch of cinnamon and nutmeg to the recipe for warmth and flavor. 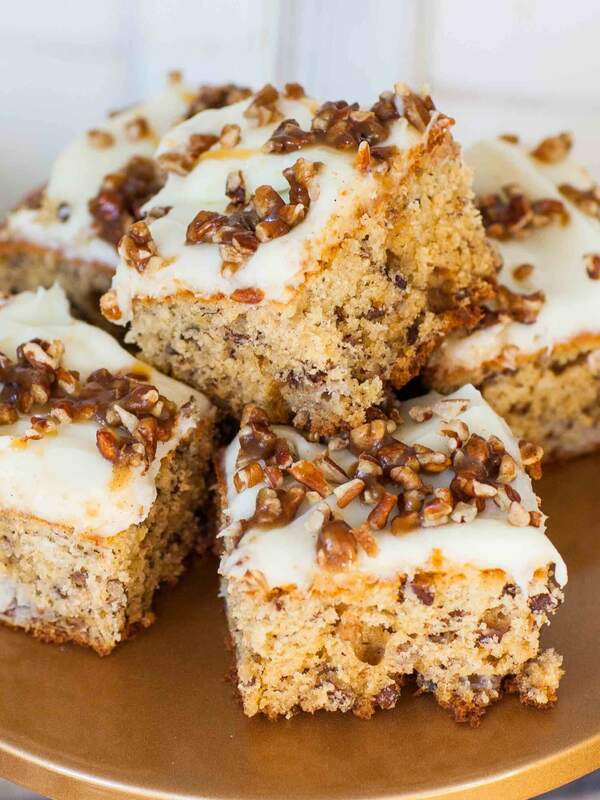 Once you try this banana nut bread recipe, you’ll want it all the time! Watch my video recipe for the instructions and details!Want new recipe updates? Subscribe to my YouTube channel to get a notification each time a new recipe goes live! I can’t believe I still haven’t shared my family recipe for banana nut bread on my blog! This recipe has been in our family for over 15 years and for a good reason. I remember baking this bread when I was much younger and just starting out in the kitchen. The aroma of this bread is simply amazing. For these banana nut bars, I wanted to take my family recipe and bring it up a notch! For added crunchiness, you can also add my simple brown sugar pecan crumble topping. It’s super easy to make and just makes these bars that much better! And, try adding a drizzle of caramel sauce over the bars when you’re ready to enjoy them. Use my easy home-made caramel sauce for the best tasting results! 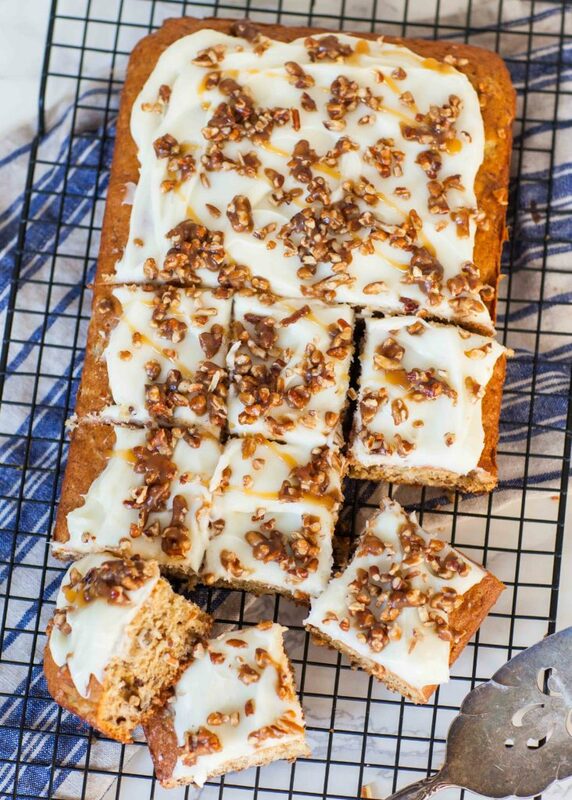 You won’t believe how fluffy and light these banana nut bars are! Check out this close-up! And if you enjoyed the recipe, please share it and save it to Pinterest! Add a drizzle of my ‘Home-Made Caramel Sauce’ for an extra bit of sweetness! And try my ‘Banana Cream Cake Roll’ next! Made with fresh bananas and cream cheese frosting! This non-stick brownie pan is great for this recipe. I love my handheld KitchenAid mixer – it’s great when I don’t want to use my big mixer. These off-set spatulas are so useful for spreading batter and frosting! Preheat the oven to 350F/177C. Line the bottom and sides of a brownie pan; mine is about 13x7-inches (33x17-cm) in size. In a large mixing bowl, beat together the softened butter, sugar and vanilla for 2 to 3 minutes, until the mixture is creamy. Add the eggs and mix again for 1 minute. Peel the bananas and crush them using a large fork or food processor. Add the banana puree to the batter and fold it in. In a separate bowl, combine the dry ingredients: flour, baking powder, baking soda, cinnamon, nutmeg and salt. Sift the dry ingredients into the batter and fold gently just until the flour is incorporated, then fold in the pecans. Transfer the batter into the prepared pan and spread it evenly to the edges using an off-set spatula. Bake the banana nut bars for 30 to 35 minutes, until golden brown on top and a toothpick inserted into the center comes out clean. Remove the bread from the oven and cool completely on a wire rack. Once the bread is cooled, prepare the cream cheese frosting. In a large mixing bowl, whisk the cream cheese for a few minutes, until it's creamy and smooth. Add the maple or vanilla extract, confectioner's sugar and a pinch of salt. Mix again for a few minutes until the frosting is smooth and creamy. To make the frosting thinner, just add a few tablespoons of heavy cream. Spread the cream cheese frosting over the banana nut bread with an off-set spatula. For the optional topping, simply combine the melted butter, sugar, nuts and spices in a small bowl, then sprinkle over the frosting. Can I use a 9 inch round pan? made it. easy and very yummy. Made it in the 13×9, it wasn’t as tall as on the picture but boy was it delicious! Can I make these in cupcakes instead of bars? Thank you!